​Local Ranch Raised Beef - Sold by the Pound!! Mon - Thurs by Appointment! Call, Text, or stop by Today! Online Orders - Please let us know a time you'd like to pick up your meat. Black Angus Hamburger patties, great flavor. 1/4 pound patties. Comes in 1 pound packages. Full of that home-grown beefy flavor, lean, and very versatile make it the perfect meat for burgers, meatballs, tacos, meatloaf, spaghetti, sloppy-joes and anything else that calls for ground beef. One taste of our hamburger just might hook you for life! 50 lbs of the most Beefy tasting ground beef, stock up and save! $4.70/lb Local Ranch Raised Black Angus hamburger, enjoy in spaghetti, burgers, sloppy joes, casseroles, and many more! We breed top cows & bulls to bring the best black Angus beef available to the table. Every animal is fed on our grass mix pastures and hay, we have never used GMO seeds on our pasture or hay ground. For those who prefer grain fed beef we have separated a couple animals and are feeding them alfalfa, barley, corn & molasses grain, (no by-products) this meat is kept separate from our grass & hay fed beef. ​Please give us a call if you have any questions or would like to come buy some Black Angus Beef. Packaged Beef Now Available at our Ranch Store! Come get some Amazing Black Angus Beef! 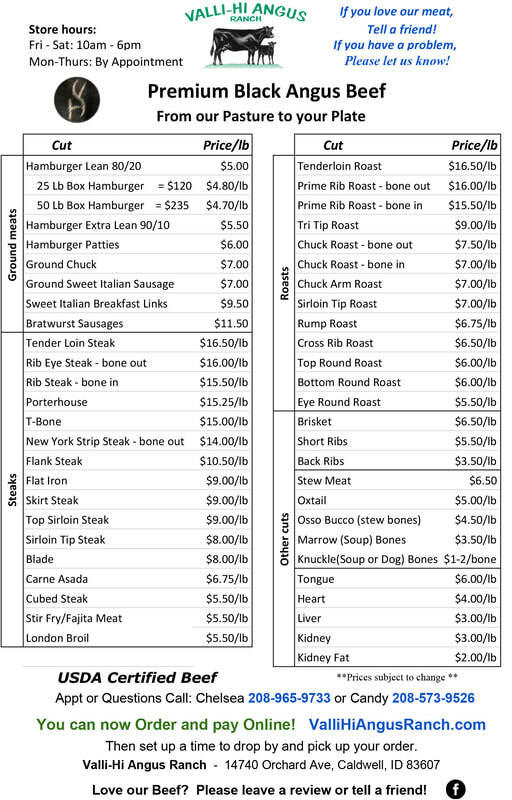 Buy 1/2 or 1/4 beef, sold by the hang weight $3.20/lb hanging + payment to butcher for their fees. or fill out a contact form here and we will contact you. 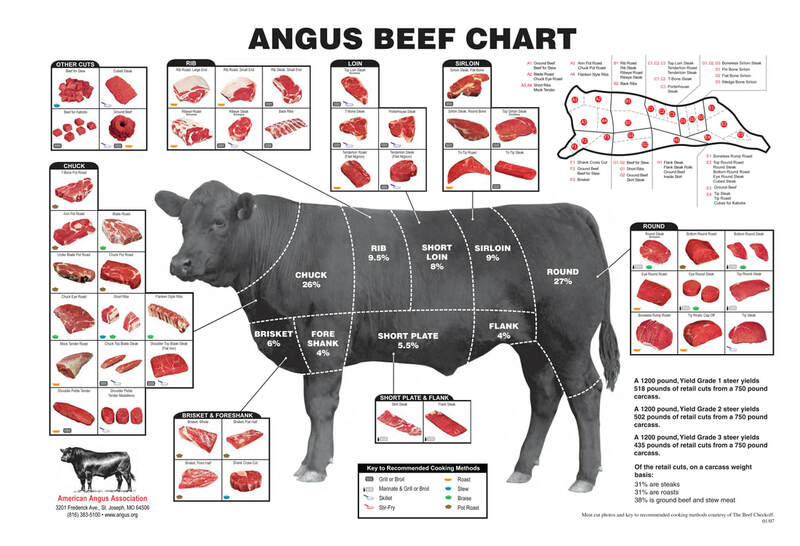 To download a printable pdf file of the beef chart Click "Download File". Be sure to print on "Landscape" and click "Fit to Page". "The Rib Eye steak we lightly seasoned and grilled had a fantastic rich flavor. Nothing like it from anywhere else." Ken G.
"Just a great family run shop with the best beef around!! Have bought there several times and will be back!!! Great people, great product & great prices too!!" Michael H.
"What a pleasant surprise to find this little ranch store with superb hamburger meat! We're looking forward to the steak we bought now. Thanks"
"You all are great! We will definitely be back. The steaks tasted wonderful." - Sherry A. "BEST BEEF EVER!!!! Everyone I’ve talked to love Valli Hi Angus beef. It is the best!!" "Stellar service outstanding beef...happy happy:)" - Jim S.
If you'd like to share your review, we'd love to add it to our website, thank you so much!